America Home Crafters Remodeling installed my Andersen windows and patio door & they did a great job. Also they replaced the gutters in the rear of my home and installed the GutterShell. I’m very happy with their work. They were very polite and on time when coming out to do the work. Gene was really helpful especially with resolving the water that was coming into my home. I waited to after we had a good rain to write this review. Now I can say I have no more water getting into my home. Thank you for your for great work and I definitely would recommend them. Gene responded to my inquiry almost immediately and was very accommodating: he scheduled a meeting for a few days later based on my hectic schedule and lack of availability (lol). He was really attentive and patient as I walked him through the problems in my house: a leaking entry door, a leaking roof in the garage, leaking windows and water damaged window sills, and an old ill-fitting/drafty door between the house and the garage. Gene took a look in the attic and discovered that there was evidence of leaking there too; Tom confirmed that in a follow-up visit a few days later. So much for the new roof 10 years ago! After considering my options, I decided to have America Home Crafters Remodeling install the GAF Timberline Ultra HD Roof Shingles, Andersen Fibrex Windows with solid wood window sills, new gutters and soffits, and a fire rated door from the garage to the house (to improve on energy consumption and comfort). The GAF roof shingles, gutters, and soffits were installed rather quickly and looked amazing! I awaited the arrival of my new custom Andersen windows and, in the meantime, it rained and water came into the house through the door frame of the entry door. We couldn’t believe it! Tom came out the next day and determined, with some deductive reasoning and the garden hose, that the rain was getting behind the 32 year old aluminum siding, and whatever insulation was behind that, and running into the house down through the door frame (and who knows where else!). The siding was oxidizing and looking pretty worn and I was feeling even more worn. I needed this home to not leak and I needed peace of mind! I decided to have them remove the old siding, insulate the house, replace the entry door and frame, which potentially had rotted wood after so much exposure to rain, and replace the sliding glass door to the patio which had been installed upside down! I ordered the Alside Charter Oak Vinyl Siding, a custom entry door with an Andersen storm door, and the Andersen Narroline Gliding Patio Door. America Home Crafters Remodeling installed the Andersen Fibrex windows, the window sills, the custom entry door, the Anderson storm door, the fired rated door from the garage to the house, and the Andersen Narroline Gliding Patio Door in one day! A few days later, they installed the insulation and Alside Charter Oak Vinyl Siding. The house looks and feels AMAZING, it no longer leaks (we’ve had several driving rains), and I have a peace of mind about that for the first time in 20 years. Gene and Tom are diligent, accountable, persistent (they didn’t give up until they fixed my leaking house! ), and wonderful to work with. They explained what they were going to do each step of the way and they explained the warranties for the materials they used. 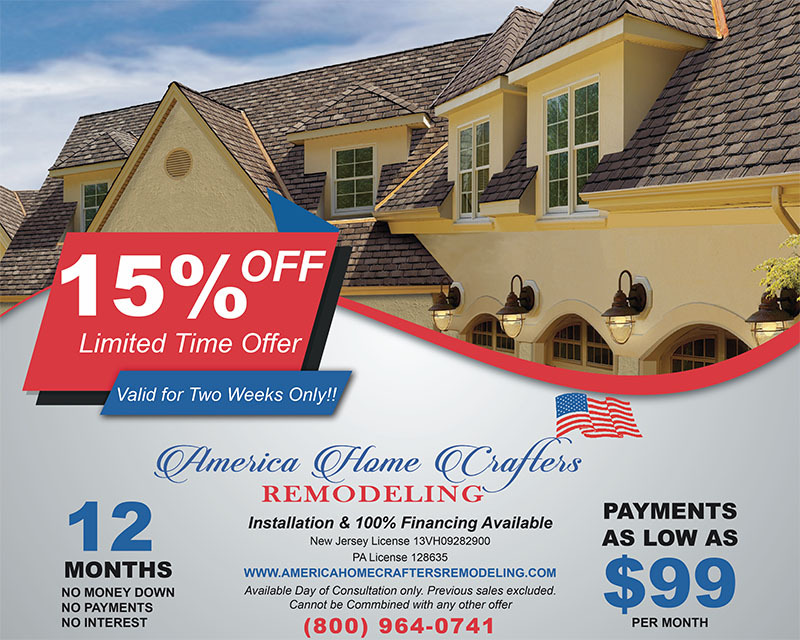 I feel really good about my decision to use America Home Crafter Remodeling: they use quality materials and stand behind their work. I don’t believe there is another company out there that has this much dedication to its customers. This was an expensive project but I look at it an investment in my home and in my peace of mind, and well worth it! Plus, I now have the best looking house in the neighborhood, which, while that wasn’t my goal, is definitely a bonus! No project is ideal. Especially in a house with decorative trim gutters as well as functional ones, and 60 years old to boot. Even though the gutters were replaced in the past they were still on an old house. The installer Ed took his time trimmed the gutter shelf to fit correctly at every corner. I followed around and looked at his work. He added brackets to the gutters where needed to make them straight for a clean and finished look. I am not easy to please. I am satisfied my job was done correctly and as pleasing to the eye as possible. Not cheap. But I never need to clean the gutters again or worry about them overflowing causing a water problem in the basement. The value is there for me. We spoke with Tom, the owner who was both knowledgeable and helpful on the subject of our gutter and drainage problems. They showed up in a timely manner and the project manager Ed did a tremendous job fixing our gutters and adding the Gutter Shield to all of our gutters. They were both professional and we’d recommend them to anyone looking for this type of service. Thanks again Tom and Ed for a job well done! 5 stars! Working with TOM and Gene was totally stress free. From signing the contract for our 2 Anderson custom bay windows to the installation day was easy. Gene came to the house, he was very knowledgeable and professional. TOM and Gene know their windows. Anderson are the best quality around. The prices are very competitive. We also had POWER come out to the house and their pricing was higher for windows that were not even custom to what we wanted. We would have had settle for less and pay more. TOM helped us design our windows and we got exactly what we wanted without having to settle. The customer service I received was outstanding. They kept me updated on the progress of my order. Installation day was a breeze! TOM the contractor/installer was a professional. They showed up on time and the first thing they did was put clean tarps down to keep my stuff clean. TOM let us know what he was doing every step of the way, (no “wondering” why or what when they did the work). No other contractor that I have had in my home has done that. I always had to ask. Tom’s team was very polite and friendly. They knew what they were doing. They worked well as a team. Toms workmanship on the wood interior window frame, molding and sills was exceptional. The outside capping and window trim was perfect. They cleaned up, you would never have known they were there. Except of course my new beautiful Anderson Custom bay windows!! The windows are the best quality you can get! And it shows. The SMART SUN glass is baked into the windows so there are no spots or dirt on the outside after rain. I was a skeptic, but it is true. It has rained and I have 60 trees on my property, we get a ton of dirt and spots when it rains on our windows. But NOT these windows, they are crystal clear. I will definitely refer them to my friends and family. 5 Stars for sure!